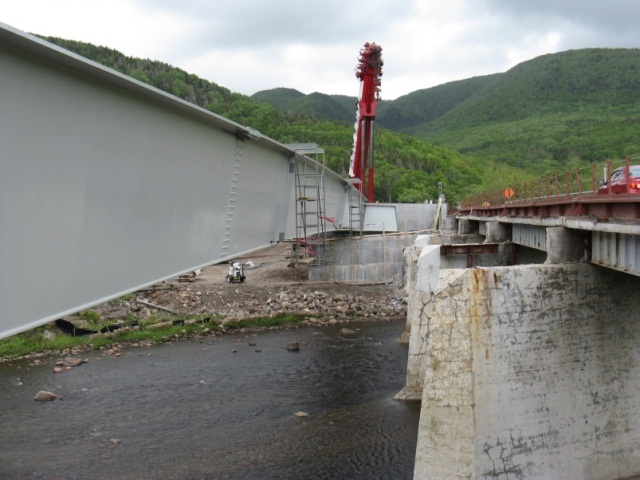 The former Cheticamp River Bridge consisted of a four simple span riveted steel girder, reinforced concrete deck superstructure, founded on three in-river concrete piers and concrete abutments and retaining walls located at each end of the bridge. The structure underwent several stages of rehabilitation, but in 2006 after a detailed inspection it was recommended that the 73 meter long structure be completely replaced. In response to the recommendations, PWGSC issued a call for proposals for the replacement of the Cheticamp River Bridge in 2008. 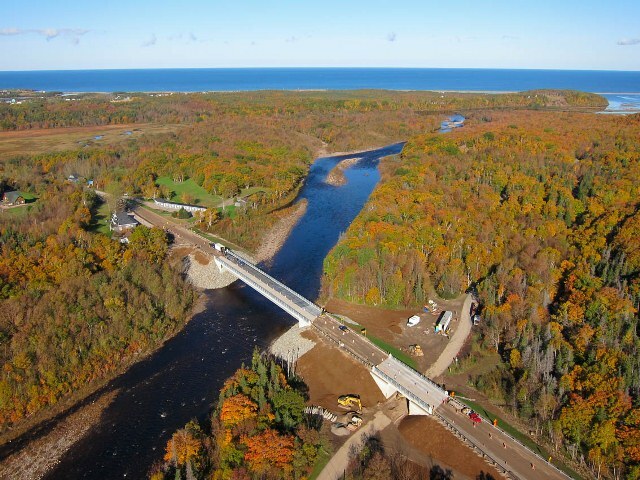 The project objective was to remove and replace the existing Cheticamp River Bridge in an efficient, cost-effective and environmentally friendly manner and to realign the approaches on each side of the bridge to NSTIR standards. With the bridge located at the entrance to the Highlands National Park, it was essential that the replacement structure and realigned approaches be aesthetically pleasing, blend with the National Park setting and incorporate elements that would distinguish the structure as the entrance to the Cape Breton Highlands. After a preliminary design stage that evaluated several options, it was determined that a long simple span twin trapezoidal steel box girder bridge, complete with a composite precast concrete deck system best satisfied the project objectives. The replacement bridge is an 81.5 m single span structure on a 34 degree skew with semi-integral abutments founded on steel pipe piles driven to refusal in bedrock. To mitigate the construction schedule a full-depth composite concrete deck was designed to allow panel fabrication to take place in parallel with girder fabrication and eliminate the need for expensive suspended formwork. HEC created comprehensive three dimensional finite element models to complete the bridge design, evaluate skew effects in the girders and bearings, determine seismic effects, and to determine load effects during the phased construction procedure. It is also the only option that allowed construction to begin in November 2009 and be completed in October 2010. All other options required in water work at the start of construction and therefore the start of construction would have to be delayed until the following July due to the mandated time frame for in water work. 40% of the existing bridge was demolished and the remaining 60% was kept open to traffic as a one way alternating detour while construction of the new bridge progressed. With part of the new structure complete, traffic was diverted to the new structure and demolition of the old structure was completed. This option eliminated the need for a new, separate detour structure and thereby minimized the overall project cost as well as the impact on the environment and private land owners. The option did complicate the construction by bringing traffic and construction close to each other however, well thought out construction phasing, included on the project drawings, minimized/eliminated problems during construction. In addition to the river bridge design, HEC was also responsible for the design of the temporary lagging retaining walls along each approach, the design of the underpass structure immediately east of the river bridge, and the erection design for the 81.5 m steel box girders. 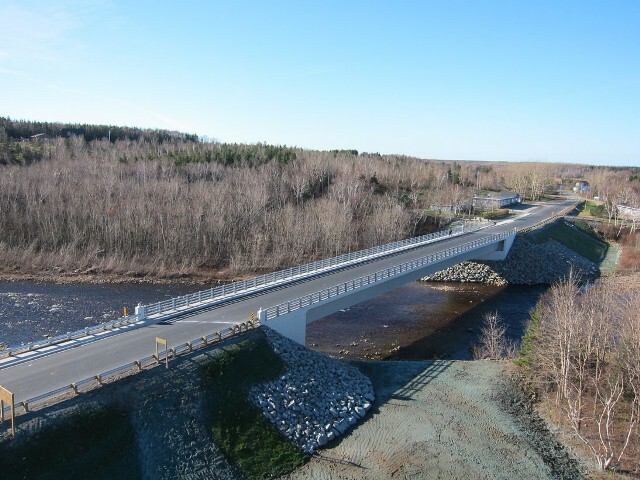 HEC was awarded the 2011 CISC Atlantic Chapter Steel Design Award for Engineering Excellence for the design of the Cheticamp River Bridge.